1- Where are the apple farms? 2- When is the season starting? 3- What is the job? 4- How much is it paid? The apple season has always been a good purveyor of seasonal jobs in New zealand. Farmers usually don’t find enough local people to fill these positions, and therefore are greatly relying on Pacific Islanders holding a RSE Visa, or on backapers travelling with a Working Holiday Visa. Indeed, as apple picking is physically demanding, being young and fit is an asset. 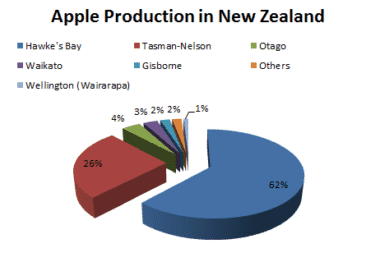 The apple production in New Zealand is a huge sector for such a small country. The estimated crop for 2014 was close to 500 000 tonnes, which represents around 1 400 000 bins. If you consider that an average picker will pick about 200 bins over his season, it represents at least 7000 apple picking jobs. The New Zealand apple industry is seriously focused on the export market (about 60% of the production). It means that the quality control during the harvest is often stricter than in the countries which are more focused on the local market. There are about 500 apple growers in New Zealand. Where are the apple farms? Close to 90% of all NZ apples are grown either in Hawke’s Bay (62% of the national production) or in Tasman – Nelson (26%), leaving only a little share to the remaining growing areas : Otago, Waikato, Gisborne and Wellington. 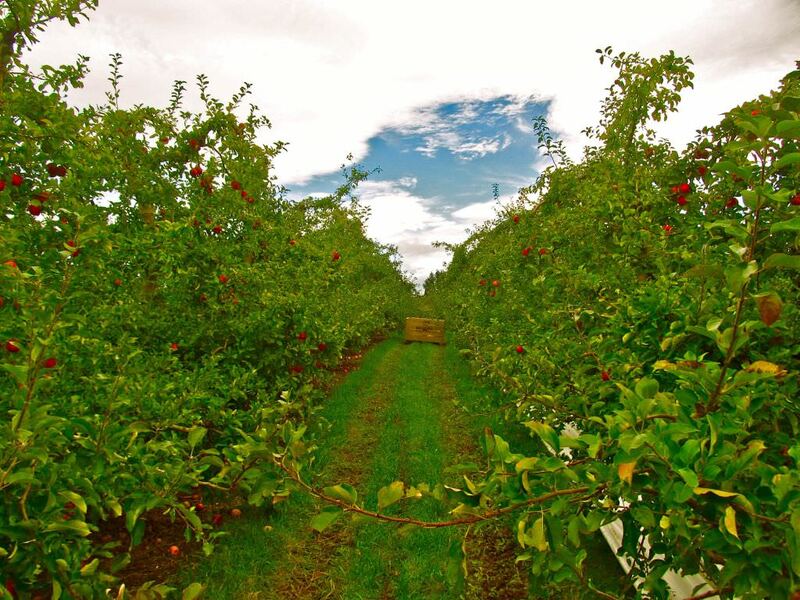 In Hawke’s Bay, most of the apple orchards are spread throughout Napier and Hasting. In Tasman, the vast majority of the apple growers are located around Riwaka, Motueka, Moutere and Richmond. In Otago, most of the apple farms are gathered around Roxburgh. When is the season starting? Most years, the apple picking season starts in New-Zealand around mid-February. In 2014 some farms started as early as February 10th, but the 2015 season was a bit late and did not start before February 20th, even in the most early farms of the country (i.e. Hawke’s Bay). Some farms, which are growing Pacific Beauty (a really early apple), are starting to pick a bit earlier than those dates, but this variety isn’t grown in big volume. As in 2015, the 2016 apple season will start later than average, probably in late-February. But it should be a record crop, meaning the growers will need to pick a huge amount of apples in a short period of time, and then will need a lot more pickers than usual. The length of the season greatly depends on how many varieties are grown on each farm, but it’s commonly around 10-11 weeks. It means that most of the picking is over by the end of April or early May. 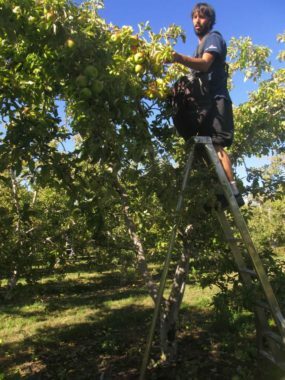 Being the southernmost apple producers in New Zealand, the orchards in Central Otago are usually starting with a 10-12 days delay behind Tasman or Hawke’s bay, and are finishing a bit later, around mid-May. 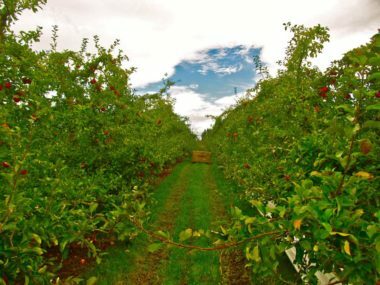 The horticultural research has been really active in New Zealand for the last 30 years, and led to the introduction of many new apple varieties in the orchards. Here are the most commonly grown, arranged according to their order of apparence during the season: Pacific Beauty, Cox, Royal Gala, Jazz, Pacific Queen, Red Delicious, Tentation, Sonya, Braeburn, Fuji, Granny Smith, Envy, Pacific Rose, Cripp’s Pink (Pink Lady). Be aware that if a farm isn’t growing many different varieties, the risk is high to have a short season, or at least to have gaps with no work available in between two varieties. As an apple picker, you will be asked to fill some big wooden square containers called “bins”. Once full, they weight around 350 kg. It represents 17 to 25 picking bags, depending on how much you fill it before you go and unload it to the bin. I’ve seen pickers packing their bag so much that they would just need 14 of them to fill a bin, but it’s way too heavy and I prefer to try filling mine with 20-21 bags. It’s important to notice that instead of the common square bins, some NZ orchards are picking in wider bins, of rectangular shape. They can fit 6-8 more picking bags. Most of the apple varieties in New Zealand are color picked (i.e. you only pick the apples matching the color asked by the farm) rather than strip picked (you pick all the apples from the trees). I was surprised to see that even varieties which are usually strip picked in Australia are color picked in New Zealand (e.g. Fuji). When color picking, you ‘ll go back through the same trees up to three times, with an interval of 5-7 days between each pick. It’s important when starting in a farm to ask if the pickers will get their rows back at the second pick, as it’s the only fair way to make sure nobody is taking advantage of your good job on the first pick. Quality standards in apple picking can be slightly differents from farm to farm, but in most cases you will be asked to be gentle when dropping off your apples in your bag or in your bin, in order to avoid bruisings (unless you are picking for juice). It’s particularly true with Pink Lady, which are as delicate as eggs and can even bruise from the pressure of your fingertips. As well, you will be asked to make sure the stem remains on, on every apple you pick. That’s why you must “twist” the apple along the branch to get it off the tree, instead of just “pulling” it. Quality control in New Zealand is a lot stricter than in Australia, and all the farms have quality controllers walking in the orchards to look at almost every bin you pick. They usually collect a sample of 50-100 apples. If more than 5-10% of them are not complying with the quality standards (i.e. wrong color, bruises, stemless, remaining buds), you usually get a warning. Several warnings can lead to dismissal. How much is it paid? In most of the NZ orchards, apple picking is paid on contract. It means that instead of being paid a fixed hourly rate, you will get paid depending on your production (i.e. how many bins you picked). So there is no secret, the more you pick, the more you earn! Well,… then the next important question is to know how much you will get paid per bin and how many bins you will pick per day. Here is the core of the problem : it all depends! Generally speaking, the bin rates for apple picking in New Zealand are lower than the ones in Australia. Also, I’ve never seen any farm in New Zealand having a fixed rate per bin. Indeed, it will rather fluctuate depending on each variety, on each pick (1st, 2nd, 3rd color pick), and sometimes on each block. It’s called a sliding rate. As a result it’s not rare to see up to 5-6 different bin rates appearing on your weekly payslip, related to the different kind of picking you’ve done over the week. 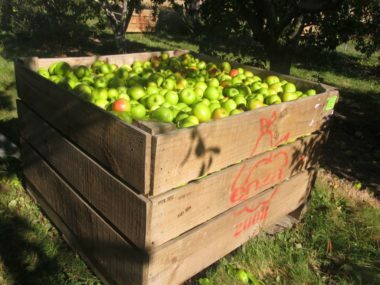 For example, if you are doing apple harvesting and are being paid by the number of bins you fill, then the price per bin may depend on such factors as how big the crop is (crop loading), how old the trees are, the variety of apples you are picking, the time of harvest, whether the crop is organic or in-organic and whether it is for the export or local New Zealand market or being used in the production of apple juice. This means that you may be paid NZ$15.00 per bin for a bin of apples picked for juice and let’s say NZ$45.00 per bin for export quality organic apples. In this example the employer must detail in your employment agreement that the rate per bin is from NZ$15.00 (lowest possible dollar value) to NZ$45.00 (highest dollar value) per bin and explain why there is the price variance. The employer can always pay above the top rates but can’t pay below the minimum. Each time you are starting a new block, I recommend you to ask the price per bin prior to start picking. It should avoid the bad surprises on your payslip. On the top of your bin rate, you should usually add 8% holiday pay. Sometimes it will be written on your contract that the holiday pay is included in the bin rate, which is legal, but then make sure you are aware of it before you sign the contract and start working (i.e. read your contract properly). But even in this case it must appear separately on your payslip. Depending on your employer, holiday pay can be paid either weekly or at the end of the season. Temporary workers who work in New Zealand for less than one year are entitled to eight per cent annual holiday pay of their total before–tax wages. Some employers include holiday pay in your weekly pay and others will pay it to you at the end of your employment. If it is included in your weekly pay, you should be able to identify it separately in your pay slip. Holiday pay is wages and as such is taxable. For example: if you are usually paid $15.00 for every bin of apples you fill, and you fill 40 bins by the end of the week, you will be paid $600 for the week. If your employer includes your annual holiday pay in your weekly pay, you will be paid $648. The additional $48.00 (which is eight percent of $600) should be shown separately as annual holiday pay in your pay slip. A piece rate is a commission where the employee is paid for the number of pieces they worked on, for example, being paid for the number of bins of fruit picked, or the number of garments sewn. Employees paid per piece must still receive at least the relevant minimum wage for each hour worked. It means than if you can’t reach the equivalent of the minimum wage while working on piece rate, your employer must top you up, so you get at least 15,25$/hour. In absolutely no circumstances somebody older than 18 years old and who is working in a fruit picking job on piece rate can earn less than minimum wage in New Zealand. So your employer must top you up of 113$ (610-497=113) for this week. Of course, if your employer has to top you up every week, then at some point you will be probably dismissed from your job, which is understandable. But if the company keeps employing you,… then they have to keep topping you up,…THAT’S THE LAW! For your employer, it’s also mandatory to keep a daily record of your working hours, and you legally can ask to see it. But in my opinion, that’s primordial that you also keep your own record on your side, in case of a dispute with your employer. As an employer, you must keep wage and time, and holidays and leave records that comply with the Employment Relations Act 2000 and the Holidays Act 2003. In particular, you must be able to show that you’ve correctly given your employees all minimum employment entitlements such as the minimum wage and annual holidays. […] Your employees have the right to know everything you are recording on their file and have the right to see these records. […] Keep wages and time records, and holiday and leave records for seven years (even if the employee has left). The number of bins a picker would pick in a day is something extremly variable and will greatly depends on the quality of the trees, the variety picked, the size of the trees, the quality of the pruning and, above all, the experience of the picker. As a novice, you first target should be to try and fill a bin in no more than 2 hours (up to 2,5 hours for color picking). It won’t be necessarily easy at first, especially if the trees are high and need a lot of ladder work. It represents about 3-4 bins on an average day of picking. If you can’t reach it after a couple of weeks, then try to change of farm to see if it’s better, otherwise don’t stick to it too much, it might just not be a job for you! Apple picking can be quite hard on the body and not everybody can handle it. After one month, if you keep trying seriously, you should definitely improve your picking skills and reach 5-7 bins on your good days. 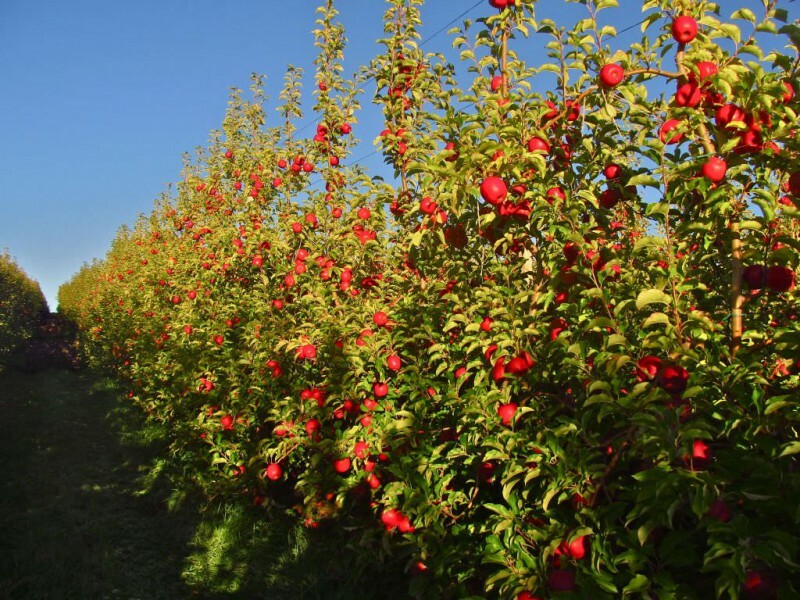 With more experience (2-3 seasons), such days should become your average and you could start to reach up to 8-10 bins when the picking is good, especially in Red Delicious and Fuji. Almost no apples in the trees, it won’t be a good picking day! As a professional picker (more than 3-4 seasons), I try to never earn less than 200$ in a full day picking (8 hours), and most of the time I’m able to pick an average of 7-9 bins per day (about 1 bin per hour), and up to 11-12 bins when the trees are really nice. It might look unaccessible if you just start fruit picking, but it’s like any other job, the more experienced you are, the more skills you develop and the more money you should make. I’ve met some top pickers (some of them have been picking apples for more than ten years) who are able to pick an average of 10-11 bins per day on a good season. On their record days, those guys can go up to 16-18 bins in 10-11 hours (no more than 30-35 minutes to fill a bin!). It sure requires a good farm to work for, a strong mind and the will to work hard, but it shows that everything is possible! – Observe the experienced pickers. It’s definitely not a waste of time to spend 30-45 minutes at the beginning of the season to look at how the fast pickers are working and try to understand why they perform so well. – Learn how to use your ladder properly. If you want your ladder becoming your best ally and not the so common nightmare for new pickers, you must learn to position it on the right way. Take time to always think about where would be the best place to put it, in order to reach a maximum of apples without risky stretching. A common misuse is to put it too close or too far from the tree. As soon as you need to stretch your arms to reach fruits, you should go down your ladder and position it somewhere else. Positionning your ladder at the right spot is crucial! – Be systematic. A common mistake of a novice picker is to pick one apple here, one apple there, regardless of any logic. You must force yourself to respect an order in the way you pick a tree (e.g. : right side – middle – left side) and stick to it for the whole day. Risk of dispersion is the ennemy number one for a picker. – Pick with two hands. It seems obvious but it’s not,… I’ve seen so many people picking 50% of the time with just one. Once again, you must try to force yourself (it’s all in your mind!). – Don’t pick all your bottom at once and your tops only after. Going up a ladder with a bag half-full is tiring, useless, and it slows you down. It’s always a better choice to start filling your bag on the top of the trees and to complete it with the bottoms. I hope this post will be helpful. Feel free to comment and ask for more precisions if needed. 20/02/2017: It looks like it’s gonna be a record bumper crop! 16/02/2016: Hawke’s Bay: Growers are scared of not finding enough pickers. To be able to work as a fruit picker in New Zealand, of course you first need a Work Visa. Usually many travelling fruit picker in New Zealand are using what we call the Working Holiday Visa. Depending from which country in Europe you are coming from, you might be entitled to apply for one of them. Here is a list to the New Zealand Immigration website, so you can have a look at what are the eligible countries: http://www.immigration.govt.nz/migrant/stream/work/workingholiday/ I just want to mention that recently many people from Serbia, Montenegro and Bosnia Herzegovina have been enquiring about the possibilities of getting a Visa for work in New Zealand as fruit pickers. Unfortunately citizen from those countries CAN NOT apply for Working Holiday Visa. Sorry. Only people from Croatia between 18-30 years old can, but it’s limited to only 100 visas per year. There’s no way that we can from Serbia come to work ? Why can’t the people from Serbia, Bosnia and Montenegro get work visas? Thank you very much for your answer. I wasn’t sure where to go. Hello…Is it possible for us from ALBANIA to come there and work fruit picking …………. Im 33 years old male from Croatia. Is there any chance for me work picking in New Zeland? Hello. Can you direct me where to apply for job? I am 29 years old from Croatia. Hi Bonnie, unfortunately there is no work visa available for citizens of Macedonia for seasonal work in New Zealand. Sorry. I’m from Macedonia but i have Bulgarian passport. Can apply for working there? Hey have just read the list of countries you have posted. India doesn’t count.Thanks for the link. I am 24 years old and i am from Malaysia can i come there for picking apples ? Hi, I am a Gambian citizen, can i apply for a work permit while in new Zealand? From what we are aware of, you can’t, but contact New Zealand Immigration directly, they will know more about it. may i ask if people like me from the Philippines can avail of the apple picking jobs in New Zealand and what would be the procedures? your kind response is highly appreciated. Hi Logan. Most apple farms in New Zealand do grow Envy apple by now, so it shouldn’t be too hard to find one. Most of the farms around Motueka area have quite a lot of blocks of Envy, maybe you should try around there. Good luck.